With so many great features it’s difficult to know where to start with this but we’ll give it a go! Perhaps one of the most clever and useful features of this design is the ‘Compact Go’ grass collection box. Addressing the age old problem of trying to reduce the amount of times the grass box must be emptied during a mowing session, the solution comes in the form of a compressive mechanism that you operate with a foot pedal as and when you feel the box is getting too full, this compacts the grass and frees up space in the front of the box. When the box is truly full and can’t be compacted any further you’ll see this is the case through the window located at the front. An inherent problem electric lawn mowers have is having a cable dragging along behind them all the time, this is both a nuisance and potential safety hazard if you accidentally run over said cable. This mower uses an ingenious solution to this problem dubbed the ‘Intelli-Cable’ management system, it’s really quite a simple solution that just means the cable moves in the opposite direction to the way you turn the mower. A great feature which is simple, effective and most importantly improves safety. Incidentally, when not in use the cable is easily stowed around the two specially positioned hooks on the handle. 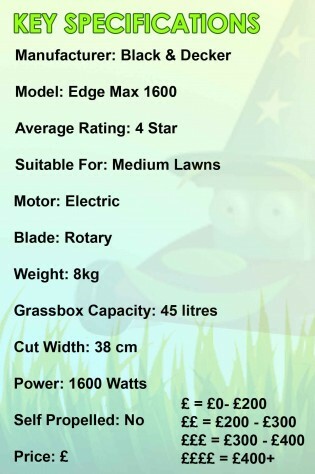 This mower also features a grass guidance system to help guide in that stubborn grass at the borders and edges of your lawn that would otherwise have to be taken care of with a strimmer. 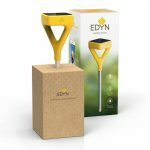 The low profile nose design also helps with reaching other hard to access areas such as under bushes garden furniture or other obstructions. 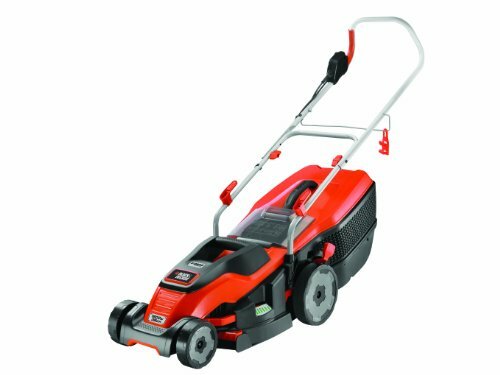 As for achieving a decent cut, this mower features an easy to use one touch height adjust for positioning the blade height that you desire, and a powerful 1800 Watt motor that will cope with even the most stubborn of grass. There really is no denying that this lawn mower has got plenty of great features that will both aid and improve your mowing experience, but that isn’t to say it’s perfect. Certainly the handlebar design could be improved, as at present it’s just a simple bent metal tube without any features to improve comfort and grip, and there is only a ‘dead mans’ lever on the right hand side which limits you if you need to momentarily remove one hand for some reason. Still, overall the pros do out weigh the cons, and with clever innovations like the grass compacting feature to boast about, this is a mower that certainly stands out among the competition.